Our Unisex Initial Pave Cubic Zirconia Signet Ring is shown and featured here in 14k yellow gold. This initial pave cubic zirconia signet ring has been a jewelry classic for many years and worn by both ladies and gentlemen. 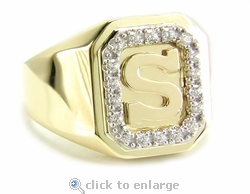 This signet ring represents a single initial of your first or last name. Signet rings have been worn for centuries and are a great heirloom piece to be handed down from generation to generation. This cubic zirconia signet initial ring has an octagonal shape and measures 16x12 mm with an 8mm tall letter of your choice. A single row of pave set round cubic zirconia stones frames your chosen initial. The total carat weight of the pave set round cubic zirconia on this signet ring is approximately 1 carat and are all hand cut and hand polished to exact diamond specifications. Select from the list of letters below. 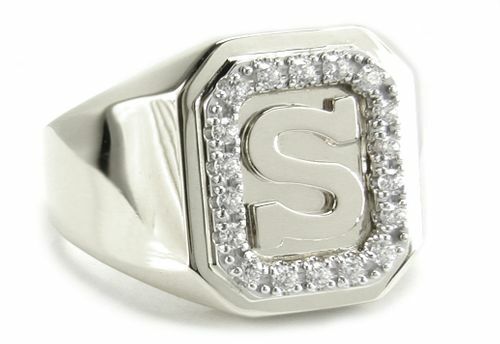 This is a unisex initial signet ring is large enough for a man to wear, but also makes a bold ladies ring. 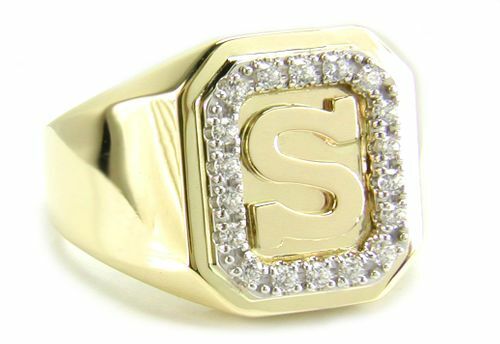 This initial signet ring is a special order and is custom made exclusively to your specifications. Smaller and larger ring sizes are available via special order. Please call 1-866-942-6663, option 2 for a quote or for further information, you can contact us via live chat during regular business hours.